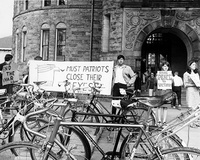 Students with signs outside Peters Hall during a protest of Navy recruitment on campus, October 1967. 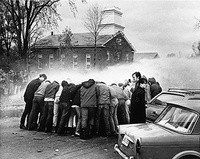 Students preventing a Navy recruiter from moving or exiting his car were hosed with water and tear-gassed by local police on October 27, 1967. The students were protesting the presence of military recruiters on campus for service in the Vietnam War.